Just had an email from one of our members who has been with Spytunes for a year and a half now. I wish to share with you something really nice that has just happened. In a large way, I credit this to Dan and The Guitar Conspiracy. I’ve not studied music formally (although I have had the usual high school exposure), never sat a music exam, and never auditioned as a guitar/songwriter. 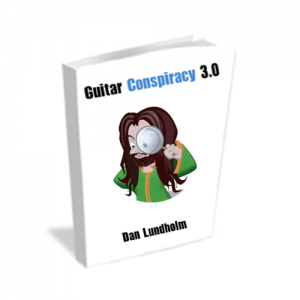 I only really seriously got into the guitar June last year when a few months later I found The Guitar Conspiracy (I had had the odd lesson here and there before though). It totally opened my eyes about the guitar and music in general. I knew I was onto something special and was inspired and committed to testing this new ‘system’ and way of thinking. Because of taking myself through the self-paced Guitar Conspiracy program, my teachers pretty much left me to my own devices and mostly played songs with me to practice technique and groove (which has been just as valuable). Armed pretty well with only my knowledge gained from and application of The Guitar Conspiracy (and a little extra reading here and there), I recently auditioned for a music course, ‘competing’ against 100s of people I assume have been doing this for ages or who have most likely undertaken ‘formal’ studies. I had to audition, attend an interview, produce a folio, do a theory and aural test. Because of Spytunes and some very supportive teachers (they know who the are), I’ve was offered a place! I just thought I needed to go through the process for experience, but it is surprising how this validates the time I’ve put in over the past year+ with the conspiracy. This is even more noteworthy and rewarding because plenty of times I’ve felt discouraged and struggled with motivation partly because I haven’t had anyone to jam with (just the Spytunes videos), and other times because I felt I just didn’t get something. 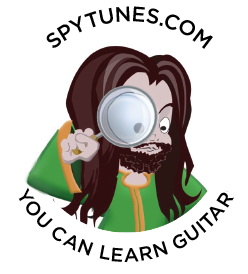 But the Spytunes community rallied around me when I asked for help and posted some very encouraging comments – just when I needed it. And you know what else? I haven’t even finished going through The Guitar Conspiracy! I’ve some beginner stuff I should go back too, some advanced stuff I haven’t even looked at and many an intermediate thing I need to reinforce. So I can only guess what other improvements are in store if I keep pushing ahead.